Every so often I experience a new “first” and this was one that came very unexpectedly. Bryan McLamara of Virginia Cinema Films contacted me in September to discuss a project he wanted to work on together. He went on to tell me about a contest AT&T has created to highlight small businesses that use technology within the workplace and (the best part) asked if he could highlight Sweet Signatures! How did we get so lucky? Eight years ago, I started making chocolate as a hobby, and here we are today being asked to make a commercial in hopes to win some prize money! Going into film day, I wasn’t sure what to expect. I was hoping for a long to-do list of activities and roles to guide me, but much to my surprise, I was only given a list of questions I would be asked during the interview. I have to admit, I was a little worried, but I knew these guys were experts at their craft, so I just had to “wing it.” As I looked over the questions, Bryan’s team was working hard to set up lighting and film equipment for the shot. I hoped that I would feel more prepared for such a big occasion, but being new to this, I wasn’t there yet. I’m a perfectionist at heart and a planner, detailed to a fault. With all of the commotion, I had no idea what I had gotten myself into, but yet, here we were. Before I knew it, the crew finished setting the scene, and Bryan was asking me if I was ready to be interviewed. Wait, what? Looking frazzled from the morning rush, I took a moment to throw myself together and sat down on his precisely angled stool under the mic. And just like that, we were off!! Did I mention I’m incredibly camera shy?! Luckily for me, my mom was just around the corner. (And so it begins…) At first, my Mom was keeping to herself and working around the store. Before I knew it, the limelight peaked her interest and she couldn’t contain herself. So what did she do? She planted herself right behind the cameraman and made herself a stand-in director. As I spoke to the camera, she began to make hand gestures and whispered comments to me as if her voice wasn’t going to be picked up by the microphones. Knowing her, I couldn’t help but laugh. I gave her a “look” and finally had to ask her what she was trying to say. She was trying to make sure I mentioned a few key points. Right after she opened her mouth, I could help but think, “Really Mom? I’ve got this!” Nevertheless, she was just trying to help as she always does, and I love her for it. You could definitely see the dynamic of my family through that quick exchange. When we finished up the interview, I began to feel more comfortable with the cameras. The rest of the filming process was smooth sailing. 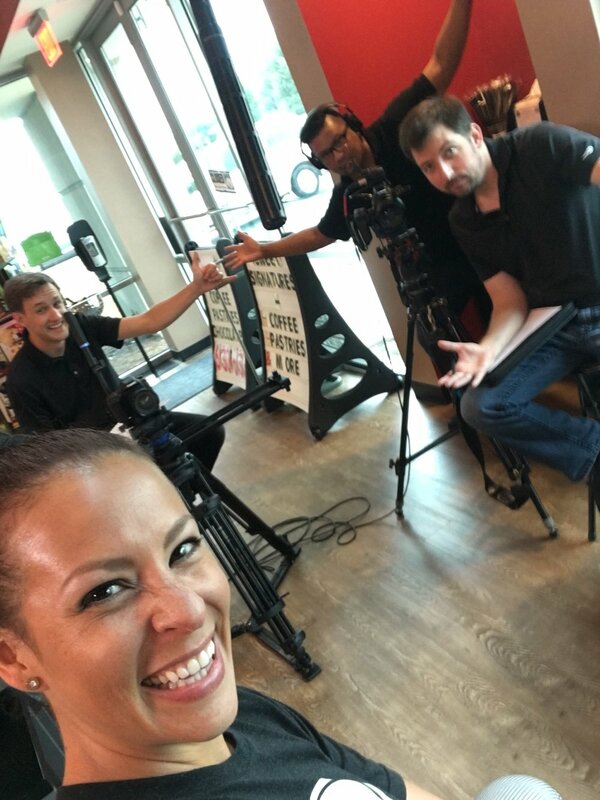 As Bryan’s team filmed various shots around the store, I went about my business in the shop and waited for any further directions from the crew. I walked out of the kitchen for a brief moment to check on something and saw the director offering an acting role to our customer, Sharon, who was waiting for her coffee appointment. It was her first time at our shop, and she was ready for action! Sharon and I acted in a scene together as I told her about our edible ink products, and she nailed it! Bryan’s team finished up the film by late afternoon, and nearly everyone in the store, including a customer, had a role in the video. My Dad was even a part of the film, and he didn’t know he was going to be in it until he showed up to work. Surprise! Too bad my aunt Meryl couldn’t join us. She plays such an important role at the store and would’ve loved it. It was a full day of shooting and totally worth it. I wasn’t sure what to expect in the final outcome, but (as you can see below) they did an incredible job. We are all so proud of the final product, and it was such an honor to have been selected by Bryan McLamara and the Virginia Cinema Films team (Bryan, Kevin and Christian) for all their hard work and dedication, and also to our staff and customers for playing along! It was such a fun experience to work with such talented individuals. Want to help Sweet Signatures & Virginia Cinema Films win this contest? Vote for our film using AT&T’s website by clicking below, and make sure to let us know what you thought on social media by sharing it with your friends!